If choreographers such as Christopher Wheeldon, Mark Morris and Twyla Tharp show us where dance may be going, the great Russians: Fokine, Massine, Balanchine, show us where it has been. But before any of them there was Marius Petipa. In 1869 Petipa was appointed ballet master to the St Petersburg Ballet, then steeped in French tradition, and proceeded to turn it around with a distinctively Russian flair. It was he who first collaborated with composer Peter Illyich Tchaikovsky on the classics “Sleeping Beauty” and “Swan Lake,” works which would shape the world of ballet for generations to come. So, who better to show off the works of this pioneering genius than the company where he began? 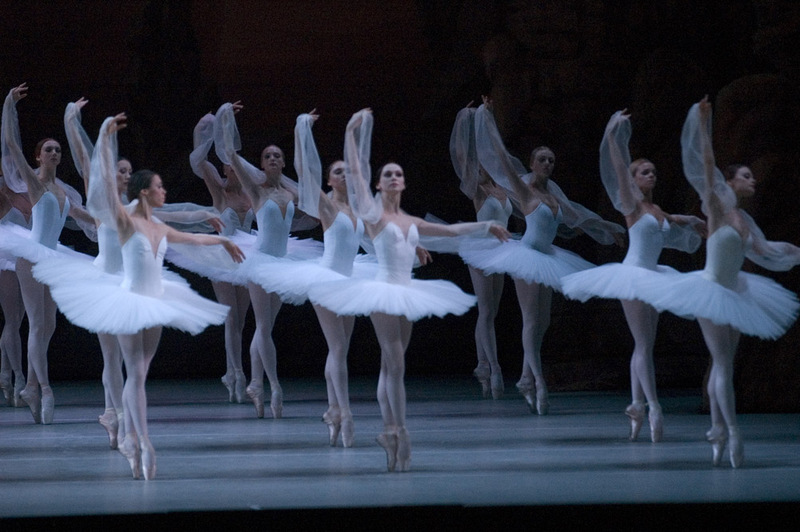 The St. Petersburg Ballet ultimately morphed into the Maryinsky Ballet, named for the theater in which it performed. Still later it officially was dubbed the Kirov and is now undergoing another branding coup. The recently-renamed Kirov Ballet of the Maryinsky Theater is presently in the midst of a tour and two separate programs guarantee audiences all Petipa, all the time. The good news is: the dances, excerpts from “Raymonda,” “Paquita” and “La Bayadere,” as well as the full-length “Don Quixote,” are impeccably performed, showing off the superb technique for which the Russians are historically known. The bad news? Well, it gets kind of boring watching the same steps, lifts and combinations over and over and over again. Not to mention the relentlessly mediocre music of Ludwig Minkus. which accompanies all but one of the offerings. The excellence of Valery Gergiev’s famed Kirov (of the Maryinsky Theater) Orchestra, here ably conducted by Pavel Bubelnikov, cannot quite drown out the oom-pah-pah tedium of the score. “Raymonda,” on the other hand, was set by Alexander Glazunov and the music is one of its chief delights. The grand Act III Wedding Scene is gloriously Russian, with a healthy dash of Hungarian paprikash to spice it up. The ensembles for heel-stomping hussars and their boot-clad ladies are delightfully folksy. Irma Nioradze was the title character and seemed a bit long in the tooth for a blushing bride. Much better was sprightly soloist Yana Selina, whose Variation was a highlight of the piece. The choreography, while historically significant, looked terribly old fashioned: lots of bourees for the ladies and entrechats for the men. And the omnipresent lift up to the danseur’s shoulder at the end of almost every number. It was a mere taste of what was to come. “La Bayadere,” famed for the slow entrance of the ghostly corps at the beginning of Act II, showed off the precision of the Kirov women. It suffered from the lack of a set. Traditionally, there is a ramp at the back of the stage which the women descend, one by one until the stage is filled with white tutus. It truly makes the long sequence much more visually interesting but was absent from this presentation. Nevertheless, the ballet glowed with the light of prima ballerina Diana Vishneva, one of the foremost landmarks on today’s dance map. Vishneva has an exquisite technique, a lovely face and great stage presence. In “Bayadere” she was supposed to be a ghost, appearing to her lover Solor (Yevgeny Ivanchenko) in an opium dream. While some of the other dancers smiled prettily in their solos – particularly a cheery trio, danced as though these girls were delighted to be dead – Vishneva never broke character, not even during the curtain calls, until her final bow when at last she smiled. And it was as if the sun had risen on the kingdom of the shades. “Paquita” is one of those faux-Spanish anomalies that exist mostly in the dance history books. Once a grand full-length ballet, full of swash and buckle, it was pared down to Petipa’s Act III “Grand Pas” in Soviet times. Gorgeously costumed, it consisted of solos and ensembles following quickly upon one another with Alina Somova and Anton Korsakov as the lead couple in the classical pas de deux. Although he looked to be about 14, Korsakov had impressive elevation. Somova went out in a dazzling blaze of fouttes and a good time was had by all – well, almost all. The crowd went crazy for the Kirov’s virtuosity. The critic went home wishing for a little more variety. A little Petipa goes a long, long way.